Anatoly Liberman's column on word origins, The Oxford Etymologist, appears on the OUPblog each Wednesday. Subscribe to Anatoly Liberman’s weekly etymology articles via email or RSS. The previous post on gorse (November 21, 2018) was mainly about the unclear connection between Engl. gorse and German Gerste “barley,” but, as we will soon find out, our shrub has a broad claim and pretends to be a citizen of the world. On the one hand, gorse seems to be isolated (no cognates anywhere or a single German plant name at best) and on the other, a crowd of suspicious relatives lays claim to a rather useless inheritance. For many decades, language historians have been developing so-called Nostratic Linguistics. The comparative method, with its phonetic correspondences (or even “laws”), is the creation of nineteenth-century Indo-European studies. Yet Indo-European has many points of contact with Semitic, because the speakers of the two families have lived in close contact for millennia. Some similarities between their vocabularies may be due to borrowing, while some, quite probably, go back to the common heritage. Yet one need not stop there. Nostratic linguists claim to have uncovered genetic ties among the languages of almost the whole world. Obviously, if it is hard to show that gorse and Gerste are congeners (and here we are dealing with two closely related West Germanic languages), ties between, let us say, German and Yakut will be much harder to demonstrate. We need neither embrace Nostratic linguistics with open arms nor ignore it. In our case, the principle should perhaps be “one at a time.” Each word has an individual history. Secure cognates turn up for the words meaning “barley,” rather than “gorse.” Very much depends on whether we are ready to look upon gorse and Gerste as related and infer that a word akin to one is, by the same token, akin to the other. After all, barley and Gerste are the names of a cereal plant, while gorse is not. For instance, Armenian gari also means “barley,” and this fact only shows that barley was known from north to south and had the same name everywhere (Armenian is an Indo-European language). In at least two Semitic languages, barr designates some kind of cereal plant, while In the Uralic and Altaic languages, gara “thorny branch; point; conifer” occurs (it alternates with kara). Assuming that gorse and Gerste got their names because both “bristle,” the proximity of the senses looks natural. Bar– and gar– are different roots, but couldn’t they alternate in the name a prickly plant? Incidentally, Old Engl. gyr meant “fir tree.” Not enough is known about the original homeland of the Indo-Europeans, and the spread of plant names has always been used for discovering that land. Here I’ll stay away from discussing such problems. Very little can be proved here, and our excursion all over the world is at best “thought-provoking,” a faintly complimentary epithet used when there is little else to say. But some inference for dictionary users should be made. When even the best authorities say origin unknown, they often mean that solid etymological arguments are wanting. So what do we “know” about gorse? It has a root (gor-) that recurs in the name of barley and sounds somewhat similar to bar. The nature of those similarities is hard to interpret, and wise people hide behind noncommittal statements. It should only be added that, as mentioned in the previous post, the meaning of –st in Old Engl. gorst “gorse” is somewhat unclear. Once there was an excellent etymologist named Edwin W. Fay. He wrote a lot and suggested many good connections. One realizes with sadness that he is almost (or entirely?) forgotten. Such seems to be the custom of our age: we tend to remember only the latest tin gods. According to Fay, the element –st was not a suffix but a remnant of a root –stha “plant.” May those who will deal with the origin of gorse develop or refute this idea. Our little tin gods. 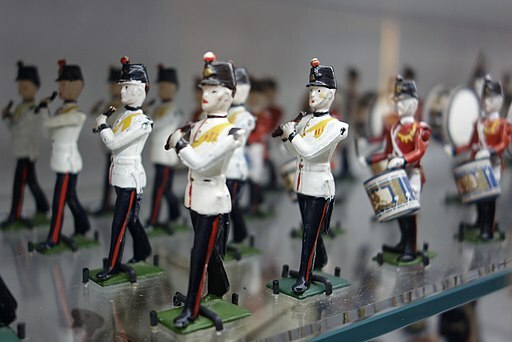 Image credit: Tin soldiers 2 – Royal Ontario Museum by Daderot. CC0 1.0 via Wikimedia Commons. Gorse is unusual in that it has two synonyms (a situation that rarely happens while dealing with plant names): furze and whin. The second of them was mentioned in this context already around 1440, in the book called Promptorium parvulorum (“Storehouse for Children”), the earliest full-scale English-Latin dictionary, a real book, not a mere collection of glosses. One wonders whether the origin of the synonyms is able to shed light on the origin of the word that at present interests us most of all. The research into the history of furze is almost a replica of the research into gorse. The main verdict sounds so: “OE fyrs (z in the modern form goes back to the pronunciation of the oblique cases); origin unknown.” Few fanciful etymologies, for instance, “from fire, because its dryness makes it fit for burning” or again from the verb for “irritate” (see the previous post) need no discussion. Or perhaps from Celtic, or a substrate word, that is, a borrowing from some ancient language spoken by the pre-Indo-European inhabitants of the area. This is where whin grows. 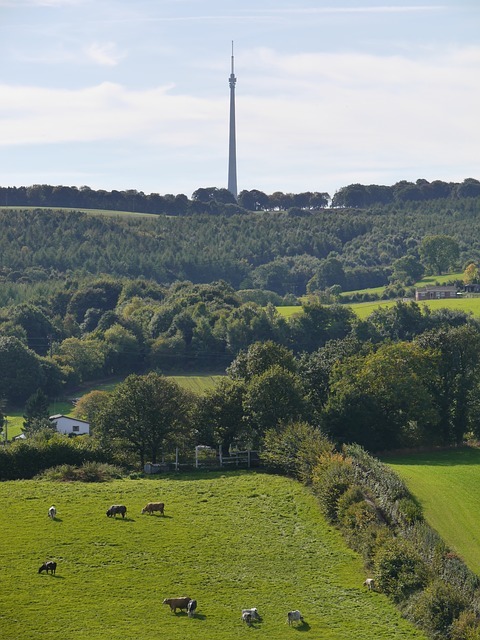 Image credit: Emley Moor Tv Mast Yorkshire by Chris Williams. CC0 via Pixabay. Now, if furze has non-Germanic Indo-European cognates, according to the First Consonant shift (known also as Grimm’s Law), its f- should correspond to p- (as in Latin pater versus Engl. father), and lo and behold, we find Classical Greek pūrós “wheat” and Russian pyrei (stress on the second syllable; many Slavic cognates) “couch grass,” or “bent grass,” a weed known as Triticum repens; Gaelic Irish preas “briar,” and numerous words meaning “spelt,” “kernel,” and so forth. Some authorities list furze as belonging here, others don’t. Thus, the attempts to find the etymology of furze and gorse are almost amusingly similar: dubious congeners, the same insecure reference to Celtic, the same medley of senses (a cereal plant side by side with a weed), and the same conflicting verdicts. We emerge from the hunt none the wiser. Whin, though mentioned in an old book as a synonym of gorse, is known much less than furze or gorse. It occurs in the northern counties, especially in Norfolk and Cumberland; also Robert Burns used it. Once again a Celtic form appears as a possible source. Franciscus Junius, one of our earliest etymologists, already compared whin and Welsh chuyn, the name of a weed (ch as in Scots Loch). This etymology can be found in Wedgwood (see the previous post) and in the first edition of Skeat’s dictionary. But later an influential etymological dictionary of Norwegian by Hjalmar Falk and Alf Torp suggested a Scandinavian etymon: certain grasses are called hven in Swedish, hvine in Norwegian, and hvine (hvinegræs) in Old Danish. Allegedly, the Scandinavian word is related to Latin caenum “dirt.” This etymology has been accepted far and wide. But there is a hitch in Falk and Torp’s idea. In Norman (that is, the language spoken in Normandy), the word vignon ~ vignot occurs. Paul Barbier, still another rarely mentioned excellent researcher, wrote that the absolute identity in meaning between Engl. whin and Norman vignot points to an etymon beginning with w rather than hv, which makes a Scandinavian origin of whin suspect. This remark was published in 1928, but never noticed, let alone discussed. Here we are at the end of our journey through prickly shrubs, bristling weeds, and cereal plants. The origin of their names is obscure: too many look-alikes, and too many incompatible senses. Perhaps some of those names are echoes from the substrate or the Nostratic past, or they are migratory words. A disappointing finale? Not really. The important thing is to try to separate the wheat from the tares. We have tried hard, and sometimes it’s the effort that counts. Feature image credit: Köppen World Map (retouched version) by Peel, M. C., Finlayson, B. L., and McMahon, T. A. (University of Melbourne). CC BY-SA 3.0 via Wikimedia Commons. 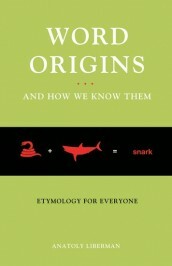 Anatoly Liberman is the author of Word Origins And How We Know Them as well as An Analytic Dictionary of English Etymology: An Introduction. His column on word origins, The Oxford Etymologist, appears on the OUPblog each Wednesday. Send your etymology question to him care of blog@oup.com; he’ll do his best to avoid responding with “origin unknown.” Subscribe to Anatoly Liberman’s weekly etymology articles via email or RSS. Incidentally, Wolfgang Pfeifer derives Ger. “garstig” (ghastly?) from a meaning quite close to ‘bristel, shruby’ (cp. also “verschroben”?). Then “borstige Borsten” (brushy brushes?) as well as “bersten” (to blast, explode, crack), participle “geborsten” come to mind, but initial ‘b’ complicates the comparison as much as the shortness of the root. – fanned varicose veins above the ancle?). Broom itself is from a root glossed “thorn, point”. Overall, note a contrasting interpretation for red and green in their semantics around growth, in which green stands for growth by spreading and red for growth by merging, simply speaking. The particulars are too numerous. Basically, it seems PIE had a system of two proper color names with different shades of grey. A connection in “green” (or yellow) and “grow” is not very doubtfull. The opposite notion, “blood binds”, is not relevant here, luckily, because it’s trickier (read: not established). Given the note on “-stha”, consider Ger. “Strauch” (bush), “Gestrüpp” (thicket), and perhaps “Strauß” (bouquet). For Gestrüpp please compare “Strippe” (string, rope, line) and “Spartium Juceum” (Ger. “Binsenginster”) and thence “Strick”, “Strecke”, “Strich”, “streichen”, “Estrich”, “strecken”, “Trick”, “austrixen”, Frankish *estrique, “striegeln” and “Stroh” for “Strauch”, and if that had any value, then compare gur- to ‘cord’, ‘gurdle’ and ‘thicket fence’, ‘curvew’, ‘obscure’, ‘corset’, Ger. “Köcher”, … “gorge”. On that note, the thorny root for broom is itself from a root glossed “edge”. The plot … thickens. For “Gerste” on the other hand, I would prefer a notion that considers it perhaps a distant relative, but with enough leaway to bring meanings related to threshing into the equation. In your post last week you hinted at a connection of “grass” with “gorse”. The English word “grass” comes from the Greek word “grassidi”, also meaning grass. (Note the double ‘s’ in both words!). Whose root “grao” (grind, chew) is attested in Classical Greek. As often happens, a multisyllabic Greek word reduces to a monosyllabic English equivalent. The ending “-idi” in the Greek “grassidi” has the sense of a ‘grassy area’. Often where sheep and cows graze. As for “gorse”, there is a similar word used in modern Greek (don’t know about ancient Greek) “gortsa” which means (wild) pears. Thought you may like to know! But why start with “gorse”? Which is obscure and mostly unknown? When there are so many more common better known widely used “plant names”? Like, for example, “chestnut”, “cherry”, “oak”, “oregano”, ” “basil”, and even the very word for “tree”! If there was an “original homeland of the Indo-Europeans”, most likely it was the Aegean! Recent ancient DNA studies show “genetic continuity” among early (Neolithic) European farmers, various Mediterranean people, the Levant and Anatolian Aegean coastline with Aegean people. Thus now establishing a second southern migratory route for the population of Europe through “seafaring”; compared to the northern overland travel. Certainly, land travel over impenetrable mountain ranges would have been more difficult for Prehistoric people than sea travel. Especially if the culture was already seafaring. As the Aegean people certainly were. Known in ancient times as “Pelasgie” (Sea People). The English word “grass” comes from the Greek word “grassidi”, also meaning grass. (Note the double ‘s’ in both words!). Whose root “grao” (grind, chew) is attested in ancient Greek. As for “gorse”, there is a similar word used in modern Greek (don’t know about ancient Greek), “gortsia”. Which means (wild) pear tree. As for “gorse”, there is a similar word used in modern Greek (don’t know about ancient Greek) “gortsia” which means (wild) pear tree.